The aim of this challenge was to calculate how much an average handbag is REALLY worth. As a savvy student (who has no money what-so-ever) I was like 'maybe this isn't for me', but I was surprised to find out, after a quick 'market research,' a.k.a referring to Google, that an average woman's handbag is worth around £200 -300!!!! So, I thought it would be interesting to see how my handbag matched up to these figures. Here's my little handbag that I'm usually carrying with me wherever I go. It's small, because I end up filling large tote bag's with endless junk, when I'm shopping. So sometimes smaller really is better! However, It doesn't stop me from obsessing over tote bags when I'm shopping! As you can see, I don't really hold my bag at much value, but this could still be interesting.. I'm very optimistic when it comes to UK weather, so my Primark £1 sunnies are always packed and ready for wearing. I this little make up bag my 'first aid kit'. That's because it has everything you could possibly need (and fit) into a bag of this size for a beauty emergency. It's got: nail file (50p), mirror (£2), lip balm (£2*), bare minerals concealer (£16), plasters, tweezers, and obviously a small packet of sweets for when lunch isn't soon enough! I also carry around £10 worth of additional makeup (whoopsie). Some more of my handbag favourites... A bottle of impulse (£1) goes with me everywhere - it's lightweight, well priced and smells lovely! Also my ted backer body souffle (£2), is great for summer days and Jack Wills hand cream (£5) was a little treat - but has lasted me ages! Finally, my bag, was £8 from a local charity shop! This is a great experiment, to see how much your actually carrying around with you! Just because It's not a shinny new I Phone, it's worth considering the value of your other items in your bag, and whether getting insurance is wise. Even if you don't fancy entering the competition I'd advise heading over to Money Supermarket, for more tips on insuring your handbag! That's all from me, I'm going to spend my evening planning outfits around the Mulberry Bag prize (did I say that..) and wishing I had more money! You can enter by writing your own "What's in my bag post" (see all the details and Ts&Cs here) and emailing competitions@moneysupermarket.com with "What's in your Handbag" in the subject line. 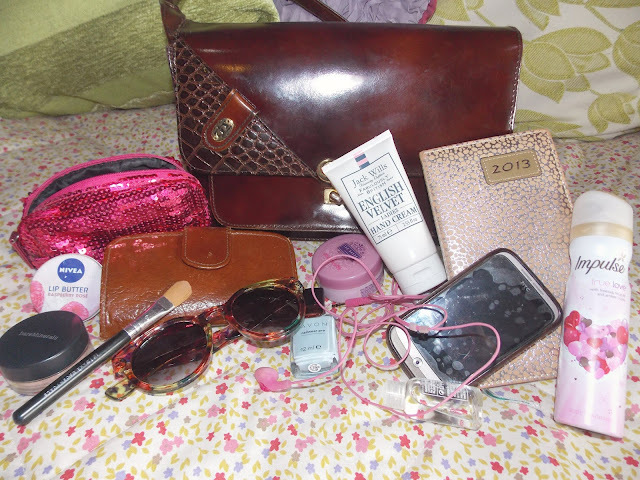 You can also check out other entries and plug your own on twitter with the hashtag #whatsinyourhandbag! GOOD LUCK! P.S. If you do enter, drop me your link in a comment, as I'd love to see some other entry's too!